Delicious Thai flavours. Served with dipping sauce. Place the pork strips in a shallow dish. Mix together the chillies, and half each of the lime juice, sugar and soy sauce. Pour over the pork, cover and marinate for 15 minutes. At the same time, soak 8 wooden skewers in water for 15 minutes. Meanwhile, make the peanut sauce: place the peanut butter in a small pan with 50ml water and stir over a low heat until mixed. Off the heat add the remaining lime juice, sugar, soy sauce, plus the shrimp paste and coconut cream, stirring to make a thick sauce. Return to the heat and simmer gently. Preheat the grill. Divide the pork between the 8 skewers. 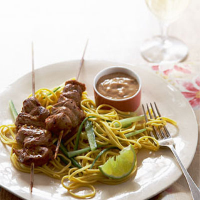 Grill for approximately 5 minutes each side and serve on a bed of shredded cucumber and Cooks’ Ingredients Egg Noodles, with the peanut sauce and a wedge of lime. fridge in a screw top jar for up to 3 days. Thin the sauce with extra coconut milk if needed.